If you need to add user input without using a button, then a capacitive touch interface might be the answer. 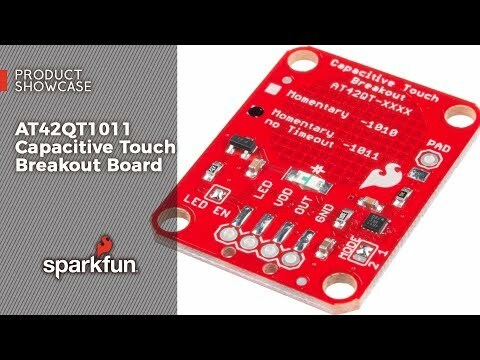 The AT42QT1011 SparkFun Capacitive Touch Breakout offers a single, momentary capacitive touch button with easy-to-use digital I/O pins. The AT42QT1011 is a dedicated, single-button capacitive sense chip. The chip handles monitoring a conductive area for touch. As long as a touch (e.g., from a finger) is detected, the AT42QT1011 keeps the output line high. Otherwise, the line is kept low. You just need to provide a power source (1.8V–5V) and ground for the AT42QT1011 to work. Additionally, a PAD pin is available if you would like to create your own external electrode. Unlike its sibling, the AT42QT1011 does not have an internal time-out, meaning that if you hold your finger to the breakout’s pad for any length of time, it will stay on. The difference between the AT42QT1010 and the AT42QT1011 is small but may be a game changer depending on your project’s uses.